Some writers just have a way of saying something. 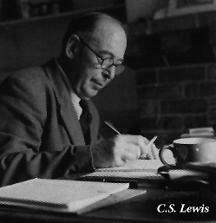 Ever since my undergraduate days (which are becoming somewhat of a dim memory by now), I have been fascinated with C. S. Lewis. His writings always stir me. He doesn’t just make statements; he draws you into what he is saying and creates an image that stays with you. At least that is the effect on me. There are so many examples I could use. In fact, I’ve included many of them in the Great Quotes section of my site (see the link at the top of this page). It is a serious thing to live in a society of possible gods and goddesses, to remember that the dullest and most uninteresting person you can talk to may one day be a creature which, if you saw it now, you would be strongly tempted to worship, or else a horror and a corruption such as you now meet, if at all, only in a nightmare. All day long we are, in some degree, helping each other to one or other of these destinations. It is in the light of these overwhelming possibilities, it is with the awe and the circumspection proper to them, that we should conduct all our dealings with one another, all friendships, all loves, all play, all politics. There are no ordinary people. You have never talked to a mere mortal. Nations, cultures, arts, civilizations—these are mortal, and their life is to ours as the life of a gnat. But it is immortals whom we joke with, work with, marry, snub, and exploit—immortal horrors or everlasting splendours. What if we were to have that image in our minds always? How would it change the way you treat your spouse? Your children? Those who are not easy to like?